So there was a bit of a battle in Berkeley on Saturday between a motley crew of alt-rightists who wanted to give some speeches and a bunch of anti-fascist (antifas) who didn’t want them to. Things got a bit, well, heated, with the alt-right anti-antifas going on a bit of a rampage. Yes, that’s right, that was one baseball-hatted defender of “free speech” carrying a golf club on the off chance that he might stumble upon a golf course in the middle of the protests, I guess. I don’t know if that guy used his golf club on any of the antifas, but there were definitely a lot of alt-rightists using their fists. 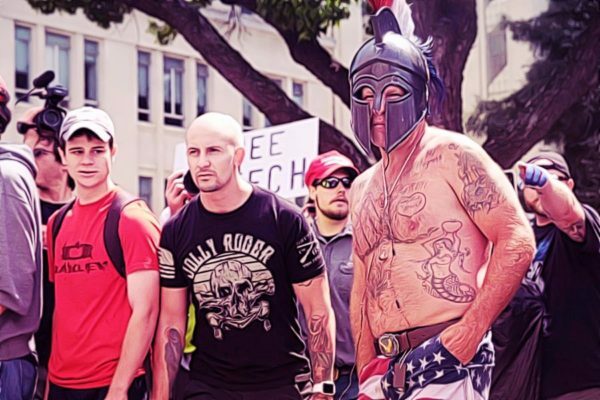 The “Proud Boys” considered the day to have been a glorious victory. Hail victory in Berkeley. What a massive humiliation for the anti-white, anti-freedom antifas. Tired: Trump will make anime real. While capturing flags is, I guess, quite thrilling, what has the alt-rightists most excited is that bit at the end of 🇺🇸MAGS4🌹Trump‘s clip above — in which one anti-antifa dude, identified by assorted observers as white supremacist Nathan Damigo, punched an antifa woman in the face. The punch was quickly memeified. Meanwhile, some of the biggest celebrity alt-right fellow travelers — who have gone to great lengths to deny being alt-rightists themselves — cheered on the violence. Some were there. Whatever this movement is called….I don't even know. But today it leveled up. Proud of everyone! Southern, ostensibly a journalist, was one of those who was there to witness the “victory” in person, wearing a MAGA helmet and accompanied by “Proud Boy” bodyguards. Meanwhile, one fellow who’s a bit more honest about his allegiences than many of the alt-right fellow travelers looked toward the future with cautious optimism. The right did good today, but it will not win every battle as Weimerica decays. Street fighting will become critical. To contrast, the right and nationalists must be willing to fight to. We must lose the chains of the false sense of the moral high ground. Why are you splaining what tradition chivalry is when the context you used the word in is clearly the meaning that Viscaria described? Unless you think feminism is about getting rid of medieval chivalric code?